at the Vatican in Rome, Italy to be included in the Vatican Archives. Fr. 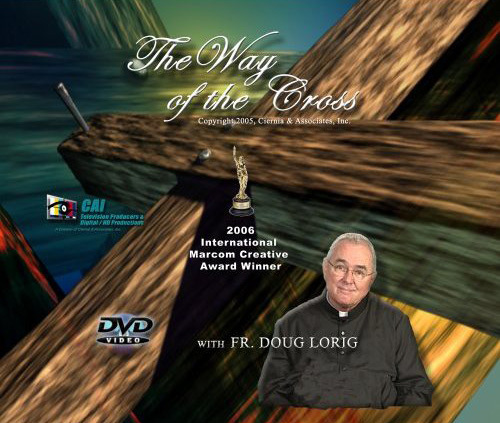 Doug Lorig is your spiritual guide as you accompany him and Christ on the road to Calvary. as they relate to Christ's journey through the 14 stations along The Way of the Cross. "Rosary for the World" - Love & Humilty is a prayerful, reflective meditation on all 20 mysteries of the rosary including the Luminous Mysteries. The CAI Television team traveled to nearly 10 countries throughout the world to capture the amazing images of Cathedrals, Basilicas, Missions, Churches, Chapels and Gardens that provide the spectacular visuals for each mystery of the Rosary. The "Rosary for the World" also includes two special features that introduce you to artist of the original art work featuredwith EWTN featured guest, Fr. Doug Lorig, Pastor of the St. de Nino Chapel and in the Luminous Mysteries and a holy perspective on the Rosary alters that adorn the Rosary Basilica in Lourdes, France. 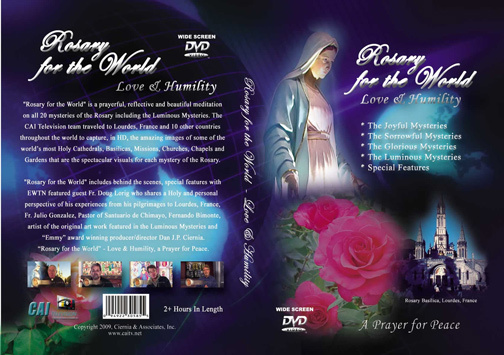 Here's what viewers are saying about "Rosary for the World - Love & Humility" and "The Way of the Cross" DVD program available NOW! "Bless you for making this wonderful product available at such a reasonable price. And thank you for the personal letter included. The world indeed needs this product. Thanks." "This is a contemplative DVD which is excellently done." 5 out of 5: "outstanding"
"We have concluded our review of Fr. Lorig's program...the audio/visual qualities are quite good,..."
"We're the nation's largest online Catholic retailer. I viewed the clip of the new DVD and the production quality looks quite good."